Marcella Hazan, maiden name Marcella Polini, (born 1924) is an Italian cookery writer who writes in English. 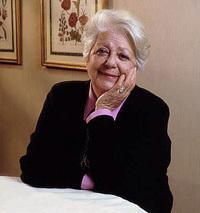 Her cookbooks are credited with introducing the public in the United States and Britain to the techniques of traditional Italian cooking. She is widely considered by chefs and fellow food writers to be one of the foremost authorities on Italian cuisine. Hazan was born in 1924 in the village of Cesenatico in Emilia-Romagna. She earned a doctorate in natural sciences and biology from the University of Ferrara. In 1956 she married Victor Hazan, an Italian-born, New York-raised Sephardic Jew who subsequently gained fame as a wine writer, and the couple moved to New York City a few months later. Hazan began giving cooking lessons in her apartment, and opened her own cooking school, The School of Classic Italian Cooking, in 1969. In the early 1970s, Craig Claiborne, who was then the food editor of the New York Times, asked her to contribute recipes to the paper. She published her first book, The Classic Italian Cook Book, in 1973. It won Britain's Andre Simon Prize. A sequel, More Classic Italian Cooking, followed in 1978; the two were collected in one volume, Essentials of Classic Italian Cooking, in 1992. In 1997 Marcella Cucina won the James Beard Best Mediterranean Cookbook award and the Julia Child Award for Best International Cookbook. Hazan's cookbooks concentrate on strictly traditional Italian cookery without American or British influence. Her recipes tend to use only ingredients that would actually be used in Italian kitchens (with some concessions for ingredients that are not readily available outside Italy). They are also designed to fit into an Italian menu of two balanced 'principal courses' followed by a salad and dessert. Hazan's recipes emphasise careful attention to detail. She recommends preparing food by hand rather than by machine, and prefers the stovetop to the oven because it allows the cook to engage more fully with the food. However, her recipes are not necessarily complicated: One of the most popular consists simply of a chicken roasted with two lemons in its cavity. Choose vegetables that are in season and plan the entire meal around them. Soak vegetables in cold water for half an hour before cooking to remove all trace of grit. Cook them until they are tender, but not mushy, so that they have a rich flavour. When sauteéing onions, put them in a cold pan with oil and heat them gently; this will make them release their flavour gradually and give them a mellower taste than starting them in a hot pan. Although some types of pasta, like tagliatelle, are best made freshly at home, others, like spaghetti, should be bought dried. Pasta should be matched carefully to sauce. Olive oil isn't always the best choice for frying; in delicately flavoured dishes, a combination of butter and vegetable oil should be used. Garlic presses should be avoided at all costs. Hazan has been credited with starting the craze for balsamic vinegar, something she later regretted as she thought people were overusing it. Craig Claiborne said of Hazan's work, "No one has ever done more to spread the gospel of pure Italian cookery in America". The food critic Jeffrey Steingarten, who once travelled to the Hazans' second home in Venice for a cooking lesson, predicted that Essentials of Classic Italian Cooking 'will become the essential Italian cookbook for an entire generation.' In a review of Marcella's Italian Kitchen for salon.com, Craig Seligman criticised Hazan's "impatient and judgmental tone", but added: "... her recipes are so beautiful and so reliable and, most of the time, so brilliantly simple that what can you do but venerate her and love her in spite of herself?" In 1998, Hazan retired from her cooking school, and she and Victor moved to Longboat Key, Florida. There Hazan found that she could no longer get some of the Italian ingredients she had taken for granted in New York, and she decided to write a cookbook for people in the same situation. The result was Marcella Says ..., published in 2004. Hazan continues to teach courses at the French Culinary Institute. In 2005, she was given a knighthood by Italy's president, Carlo Azeglio Ciampi. Hazan's son, Giuliano, is also a noted cookery writer and teacher. Together with his wife [Lael] and Marilisa Allegrini, one of Italy's most distinguished producers of noble red wine, he runs a cooking school in a restored 15th century villa, outside of Verona, Italy. In 2007 Giuliano received the coveted Cooking Teacher of the Year Award from the International Association of Culinary Professionals, IACP. Giuliano is a regular guest on NBC's The Today Show. It uses material from Wikipedia.